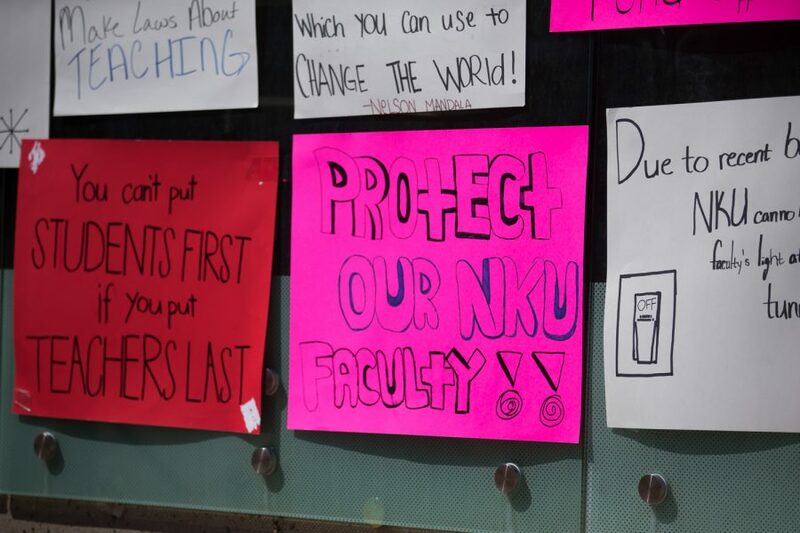 Signs hung on wall outside the Student Union on April 12. Freedom of speech is a pillar of American democracy, and because of it, every American has the right to openly express themselves—that doesn’t mean everyone has the right to express themselves wherever they want. College campuses in Kentucky have been overwhelmingly identified by the Foundation for Individual Rights in Education (FIRE) as “not compliant” when it comes to First Amendment freedoms. According to FIRE’s most recent “Spotlight on School Ratings,” only one of the nine public universities in Kentucky are in compliance with the U.S. Constitution and Bill of Rights—Eastern Kentucky University is the only exception. Something as small as the wording of a campus policy can make a university fall out of compliance. FIRE rates a university’s level of compliance with colored lights: “red” means at least one of the campus policies violates students’ freedom of speech; “yellow” means a policy is in place that is vague and could prohibit a substantial amount of protected speech; “green” means the campus is compliant, but it does not mean the school actively supports free expression. With that in mind, FIRE lists NKU as “in the red.” How did NKU get on such a list? However, NKU removed that clause from their updated IT Acceptable Use Policy in 2018. That doesn’t make the point moot, but it illustrates the importance of being in line. Another major component of HB 254 is correcting the verbiage behind “free speech zones,” areas on Kentucky campuses where freedom of expression is allowed without interference from the university. Torres recounted a time when he visited Morehead State University with EKU’s chapter of Young Americans for Liberty. When they visited, they wanted to sit and pass out flyers, or table; Torres and his group were explicitly told to move to a very particular location. “We were pushed off to this little area underneath the bell tower that none of the students were seeming to walk by—we were watching them all walk down another path, but we were kind of told under threat of being told by campus police to leave, or by university administrators, that we cannot leave that little area,” Torres said. As of this writing, Morehead still enforces a “Free Speech Area” on their campus. This, and other policies, have also put Morehead in the “red” with FIRE. NKU, University of Kentucky, University of Louisville and Morehead all list reasons for needing high foot traffic areas free of protest. Most suggest that these areas need to be free from obstruction for safety reasons to avoid people blocking entrances and exits to buildings. But what constitutes as high foot traffic—or any other specifications for where someone can protest—is what concerns Torres and Cole Cuzik, a policy analyst for Family Foundation of Kentucky. “Universities have kind of taken advantage of the fact that students are usually young adults, they’re not financially well off, they don’t have a legal background and know how to defend themselves in court and they’re not interested in getting into multi-year litigation against the university,” Cuzik said. With the passing of HB 254, students now have more liberties while on college campuses. Though it may not have been prevalent at NKU, other campuses across Kentucky will likely experience a change. “I think the whole point of this bill is for students not to have to notice; the reason why it’s happening is because they do notice their free speech rights aren’t being protected,” Cuzik said. No organization or institution is free of mistakes and freedom of speech plays both ways for any party involved in deliberation or conversation. NKU having a clause about not harassing others doesn’t appear to be a matter of control but a safeguard for students. The level of compliance for any post-secondary institution in Kentucky shouldn’t be assumed based on a third parties assessment and any student is capable of learning more about their universities stance on their First Amendment rights. 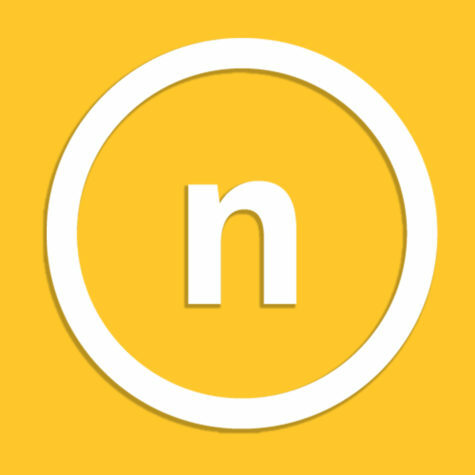 For more on NKU policies, visit their AZ Policy Listing site for an alphabetical listing of all policies campuswide.